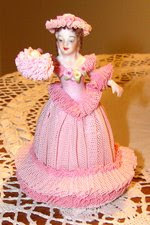 Lagniappe: pink saturday and a humbug boy! pink saturday and a humbug boy! last week i watched gabe for the afternoon and took the opportunity to snap a few pictures of him (like more than 50!) and the little humbug grabbed my zip drive off the coffee table and walked off with it. he had been happily playing with mardi gras beads and when his eyes saw the drive they lit up! i followed him around taking pics and trying to convince him to give it back. i guess he thought it was so cute (as do i!) and fit in his little hand so well. "what? this isn't for me?" then the little sneak tried to hide it somewhere. when he saw me watching he took it out and went to the cabinets in the kitchen and put it in there. i finally retrieved it and took a close-up of it for all you pink gals out there. isn't it the most adorable zip drive you've ever seen? hope y'all all have a wonderful pink saturday visiting all the ladies from beverly's blog and HAPPY SPRING!!! I just ♥ what you've shared this week. Pink Saturday is like candy for me...just can't get enough! A pink zipdrive! Now is something I bet no one else can say they have! It's too cute! Isn't it amazing how much you can fit on these things? I don't know about the zip drive, but that's one sweet little boy there! Happy Pink Day! He's beautiful! Happy Pink Saturday. Isn't wonderful that we can buy almost anything in the color paink these days? That is one cute item! Perfect for today, and as a toy to some curious hands, lol! cute zip drive and a very cute little guy! happy spring and happy pink saturday!! How funny...and sweet. He was having a lot of fun with you!! :) I didn't even know you could those in pink. hope you have a great evening and happy spring!! Love the pink zip drive.. Honestly I have never seen one!!! But, mostly Gable is adorable!!! What a beautiful group of photos. Happy Pink Saturday and have a wonderful new week. What a cute zip drive....I love it. Mine is silver and ugly. I can see where a little guy might think it was a fun toy. Happy Pink Saturday. Love the pink zip drive! Happy Pink Saturday! Such a cute blog, thank you for sharing ! Happy Pink Saturday, blessings ! A pink zip drive. Who'ld a thunk? Happy Pink Saturday! What a very sweet little boy, and a cute little pink zip drive too! He keeps me on my toes! Cute zip drive but an even cuter Gabe! Cute pictures, cute Gabe and a cute pink zipdrive !!!! I love how even the simplest little item can enthrall a child's imagination. What a lovely post. Cute! Every girl needs a pink zipdrive! Thanks for your comment, too, and sorry if I am late! Hi! Thanks for that advice. I went to work today, bad idea. I have learn't my lesson now...it's up!! Love that adorable little boy! Happy Pink Saturday and Happy Easter!!! What a sweet little guy. Very cute. Happy Easter, Happy Pink Saturday.